The name Sierra often brings up nostalgic memories of classic adventure games like King’s Quest and Leisure Suit Larry. The company has been around for a long time, although current era efforts like TimeShift and World in Conflict didn’t exactly set the industry on fire, resulting the company being shuttered in 2008. However, last year Sierra (now owned by Activision) was revived and while they are reviving properties like a new King’s Quest, Shiftlings stands as their first original published title. 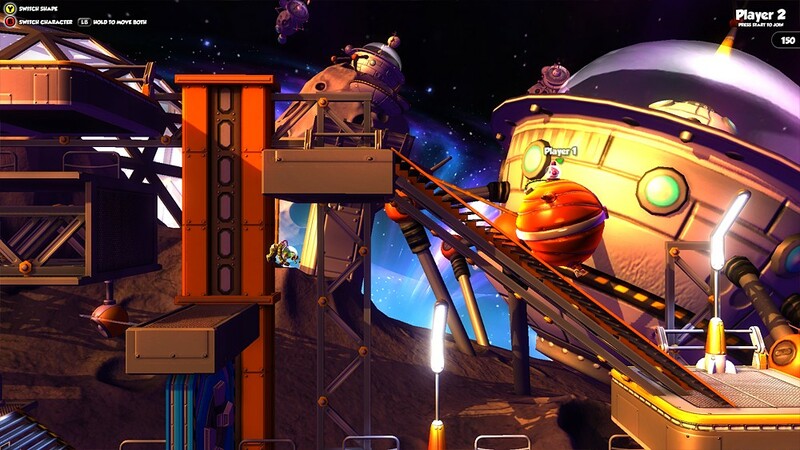 Like many properties before it, the world of Shiftlings is based on an alien television show. It’s some type of reality show following the adventures of two dim-witted janitors. These two are in full space suits, connected through an air hose. One of them inadvertandly drinks too much of the game’s fictional Black Hola Cola, resulting in the most natural of effects: too much gas. That’s right, Shiftlings is a game primarily about farts. The abundance of gas allows the two characters to shift this air back and forth through the hose to allow one player to be large and one to be small. This idea is behind every mechanic in the game, resulting in some truly interesting puzzles. The most basic part of this comes from getting through tight areas and then shifting size so the second player can come through. You can also use your inflated pal as a trampoline of sorts or use the weight of the larger player to pull the smaller along. There are five worlds in total, each consisting of 10 levels plus a bonus level. Each world introduces new puzzle mechanics like enemies to avoid or Portal 2-esque gravity lifts. The most interesting mechanic involves platforms that move every time you jump or shift, resulting in some truly complex puzzles. The challenge is elevated through three collectable Black Hola Colas hidden in each level. Getting all three will require both searching and serious puzzle solving. You can also choose to play either alone, controlling both characters, or with a buddy. Either way presents unique challenges. Controlling both can easily hurt your brain or take twice as long, while playing with a friend will require some serious communication and coordination, especially considering that both players can initiate a shift. As much as you could say Shiftlings is a puzzle game, most of the time you’ll be solving those puzzles through precise platforming. This is where the problem with Shiftlings first rears its head. The jumping and movement in Shiftlings is…off. It feels like there is input lag with every action. It is something that you constantly fight with as you try to play the game. In a game that requires precise jumps and coordination with a second character, it’s inexcusable. 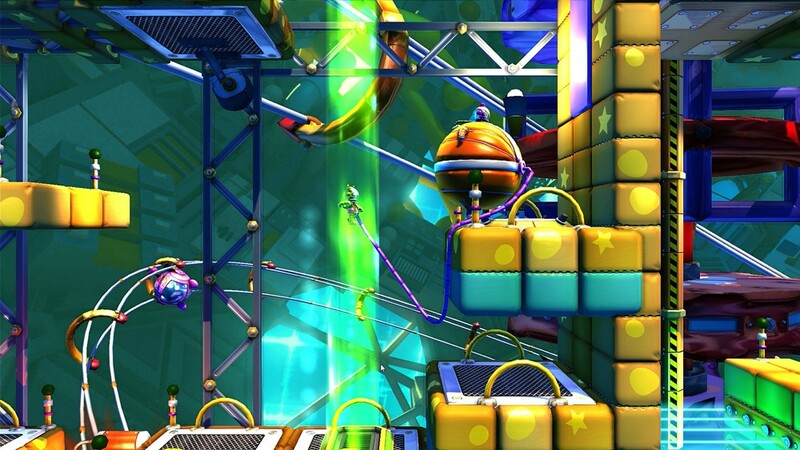 The platforming is also made more difficult by the lack of control during jumps and the speed in which you fall. The game’s most used mechanic, bouncing off of your partner, is made infinitely more difficult simply because of the controls. You do eventually get used to the poor controls, learning to hit the jump button a half-step before you want to jump and so on but it’s incredibly unfortunate. My experience with Shiftlings was fine from a technical aspect, with no stuttering or bugs to speak of except one glaring issue that I can’t necessarily say who the culprit is. About 80% of the way through the game, I returned only to find that my progress had been reset to less than halfway through the game. Being that Shiftlings is a linear game, I was suddenly forced to replay almost two entire worlds again just to see the last section of the game. I can’t say if this was an actual glitch or a result of the Xbox One cloud saving but either way it’s an unacceptable situation to be in for any game. 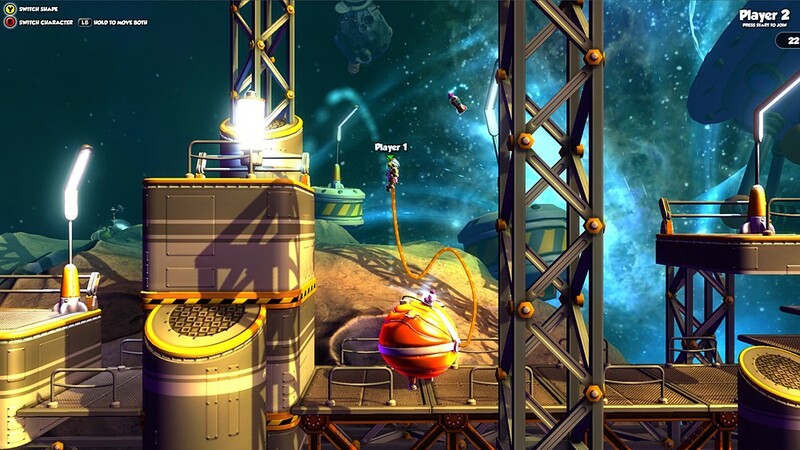 Shiftlings is a game that shows a lot of promise and originality in level design. Unfortunately the poor controls means you’re fighting to play as much as you are figuring out the puzzles. The alien television show isn’t exactly unique and the “host” is grating, constantly repeating the same terrible one liners every time you die or mess up. It shows some spark in co-op but that also means that you will be sharing the terrible controls with another player, and will likely get annoyed by watching them redo the same jump over and over again while you wait for your part. It definitely has some moments where it shines but ultimately Shiftlings turns out to have none of the magic we expect from Sierra. A code for Shiftlings was provided to Pixel Related for review. Tags: Activision, Shiftlings, Sierra. Bookmark the permalink.